Crawford was named after a Baptist minister, Rev. Peter Crawford, about 1852.289 Known as Crawfordsville until 1870 and then Crawfordville until the 1879 when it was changed to Crawford. The Mobile and Ohio Railroad came though Crawfordsville in 1857. Above is the home of George William Hairston built in 1909 on Main Street in the town of Crawford. 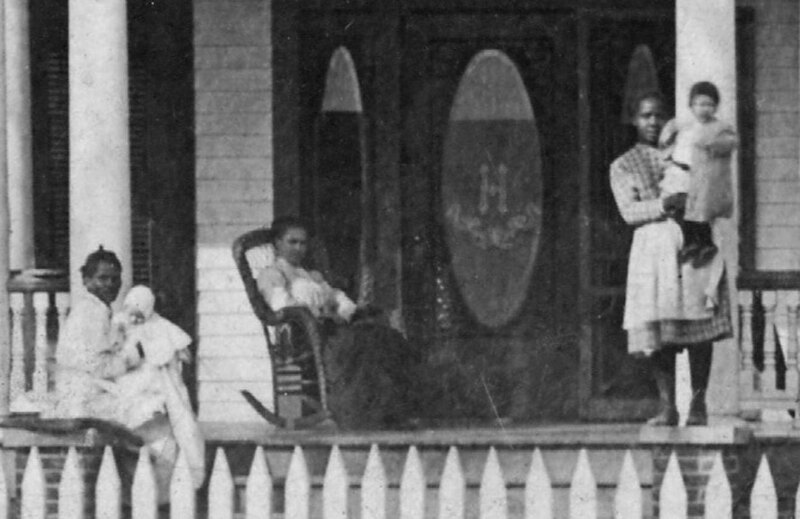 The photo shows G. W. Hairston, his third wife Ela Tharpe and nurses holding their children Brown and Nicholas. George's first two wives, Mary Watt Hairston and Virginia Antionette Ervin died in childbirth. 1821 - The Robinson Road was built in 1821 and went from Jackson to Columbus passing near Crawford. In Columbus it connected with Andrew Jackson's Military Road that went from Nashville, Tennessee to New Orleans, Louisiana. 1842 - Post Office opened at Dailey's Cross roads (southwest of Crawford). Postmaster was John A. Dailey. 1852 - Crawfordville Male and Female Institutes are incorporated by J. L. Edmonds, James A. Baird, James H. Gilmore, Mitchell Peden, John M. Lowry, John F. Carr, William B. Cavanah, N. F. Scales and P. H. Whitlock on October 21, 1852. 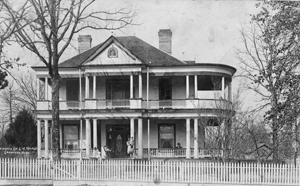 1854 - Town of Crawfordsville was incorporated on January 26, 1854. The city extended "one-fourth of a mile in all directions, from a point commencing midway in a right line between the present residence of N. F. Scales, and the house now occupied as a Female Institute, by Jesse Nash, in said town." 1861 - Mississippi secedes from Union on January 9, 1861. The Confederate States of America formed. 1861 - The Prairie Guards, Company E was formed on February 15, 1861 at Crawfordsville. 1861 - The Prairie Guard entered Confederate service at Lynchburg, Virginia May 13, 1861. 1863 - Crawfordsville soldiers killed at Gettysburg: William A. Allen, John W. Ball, Thomas Carr, George W. Edwards, Pleasant Goolsby, Henry P. Halbert, J. Leander Huckaby, Jonathan T. Jones, Liberty S. Martin, John R. Mimms, Thomas P. Mimms, Fletcher S. Norwood, David C. Wilkins, and Henry M. Wilkins. 1865 - Gen. Robert E. Lee surrendered on April 9, 1865 and Mississippi on May 4, 1865. 1883 - "August 17, Friday night fire destroyed 12 stores and 6 warehouses, loss of $100,000, insurance $16,000" Memphis Daily Appeal 19 Aug 1883 - "On one side of street were B. V. Halbert and Company, Woodin, Jim Nance, Irvin & Hairston, Randall & Smith, Smith & Reeder, Kier & Carr Brothers, N. Scales and Company and on the oppisite side of street, Ferguson, Brooks & Peace, W. P. Wyatt, Lawrence & Hales, Theophilus Harvey." From The Autobiography of a Little Man. p. 62-63.